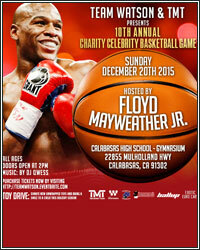 On Sunday, December 20, Team Watson and TMT present their 10th annual Charity Celebrity Basketball Game and Toy Drive. Hosted by retired undefeated former pound-for-pound king Floyd Mayweather, the event takes place at the Calabasas High School gymnasium in Calabasas, California and is designed to support the community through the LifeDriven Foundation. Bring a smile to a child this holiday season by donating new, unwrapped toys to the toy drive. Fans can expect several celebrity athletes and entertainers in attendance. Doors open to all ages at 2PM.